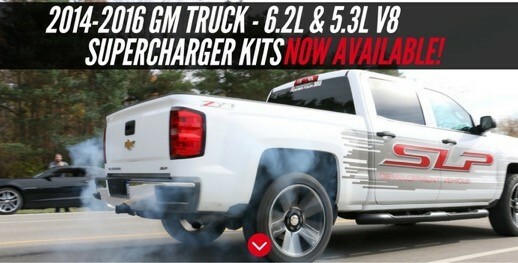 Calling all 2014-2016 Chevrolet Silverado and GMC Sierra owners! The SLP Supercharger Systems for 5.3L and 6.2L applications are now available to boost power ratings and provide unmatched and precise fitment and reliability. The SLP Supercharger System for 2014-2016 GM Trucks powered by 6.2L V8 engines boosts performance of the direct injected high-compression platform to 590 horsepower; that’s an additional 170 horsepower at 5,700 rpm and 130 lb-ft of torque at 4,100 rpm, resulting is a tire-shredding 41-percent horsepower and 28-percent torque increase over stock. For 2014-2016 GM trucks equipped with 5.3L V8 engines, the SLP Supercharger System unleashes an additional 165 rear-wheel horsepower at 6,000 rpm and 167 lb-ft of rear-wheel torque at 3,200 rpm, with an end result of 520 horsepower and 550 lb-ft or torque. That is equal to a 46-percent horsepower and 44-percent torque gain over stock! SLP’s supercharger systems for 2014-2016 Chevrolet and GMC trucks are developed in-house by talented SLP engineers utilizing OEM CAD data to optimize available space for the best possible fitment and maximum performance. The SLP 1900 supercharger system is part of the TVS (Twin Vortices Series) line of superchargers, utilizing Eaton’s TVS technology rotating assembly to deliver more power and better fuel economy in a smaller package. This is the same technology that has been used and proven for years in OEM high-performance applications such as the Cadillac CTS-V and Chevrolet Camaro ZL1. The positive displacement supercharger features twin four-lobe rotors twisted 160-degrees. By comparison, the original Eaton supercharger rotating assembly featured three lobes twisted 60-degrees. The added benefits of this design include vastly cooler discharge temps than competitive twin screw designs, higher volumetric capacity, higher operating speeds, a smoother, more efficient flow of air into the engine, and improved noise and vibration characteristics. Instant throttle response and increased power through the engine’s entire power band is to be expected after installing the SLP 1900 TVS supercharger, giving it an instant advantage over the turbocharged competition. Visit www.SLPonline.com or SLP at 855.757.7373 for more information.